Обычная цена: 8 796,85 руб. A budget friendly Inline Speed ​​Skate shoe that simplifies the transition from skate to speed skate. The Woodpecker is a easyfit "for most people. The mold used for the Junior is reading a special juniors. Doing so will the majority of people's boot fit in perfectly. The material of the shoe is easy to keep clean and waxed laces prevent re skating. The Buckle allows fast tightening for the boot and to fix. Well behind the foot in the shoe The sole is made from a mix of fiberglass and plastic. The shoe is limited by deforming heat. 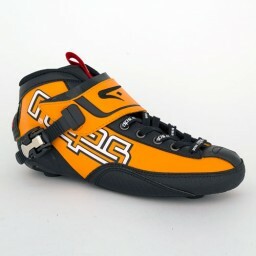 The Junior Orange boot (JR) is available from size 34 tm 40. The mounting distance of this shoe is 150mm.